Kaattum Mazhayum malayalam movie directed by Hari Kumar will bring Unni Mukundan in the lead role. Focusing on a theme giving importance to organ benefaction, the movie is produced by by Sudeep Karat and Arun M C under the banner of "Salroza motion pictures and Line of colors". Lal would be donning a prominent role in the movie which commences shortly at Kozhikode. Rising hero Unni Mukundan is not ready to miss those projects which could he could solely carry on his shoulders. With a handful of movies in kitty, the actor is gearing up for his next venture titled 'Kaattum Mazhayum' directed by Hari Kumar. The movie is based on a theme which is very important in the current scenario. 'Kaattum Mazhayum' will converse about the significance of organ benefaction, an issue which is highly germane in current society. Unni Mukundan would be donning the role of a Brahmin while Lal plays a Muslim man who suffers from serious liver disease. Produced by Sudeep Karat and Arun M C under the banner of "Salroza Motion Pictures and Line of Colours",Kaattum Mazhayum is blessed with the presence of Santhosh Echikanam who had penned the story. For the lyrics of Rafeeq Ahamed, M Jayachandran will move his fingers to tune the songs. Unni made his screen appearance through tamil movie 'Sedan'. Bombay March 12 was his debut in malayalam which gave an identity to Unni as an actor making him win couple of awards including Asianet Film Award for best debut actor and SIIMA Award for best debut actor. His impenetrable acting brilliance in Mallu Singh was a turning point which landed him in as Jordan, the sole hero of 'Samrajyam 2 – Son of Alexander'. The actor is busy shuttling from location to location with 2013 giving him better projects including D Company(Gangs of Vadakkumnathan, Pathiramanal, Edison Photos and Orissa. Hari Kumar who had won credits for his previous movie 'Sukrutham' is back after the 2010 release 'Sadgamaya'. 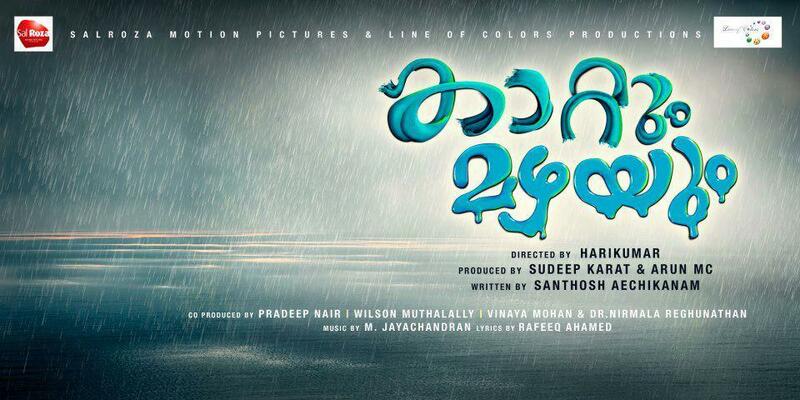 The shooting of the movie is expected to start during the last week of February at Kozhikode.